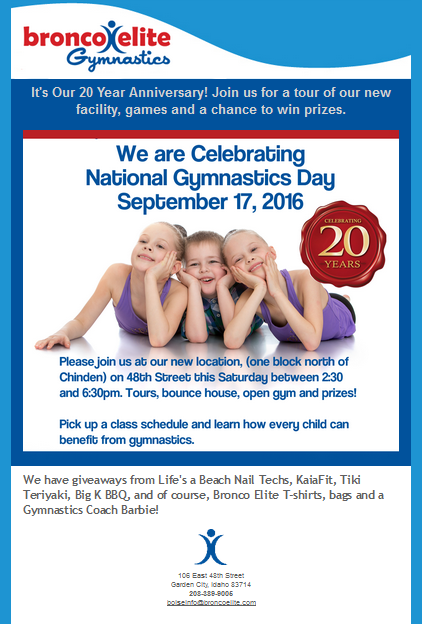 Tomorrow – Saturday September 22nd is National Gymnastics Day and there are plenty of ways for us to celebrate our great sport this year! USA Gymnastics is asking everyone to get upside down all over the nation! From Idaho to Texas to Maine, we will be doing handstands, cartwheels and flips for gymnastics! At 1pm on Saturday September 22nd Join in with gymnasts, friends and family members to find a creative way to get upside down and have someone take a picture. Then, get onto the USA Gymnastics Facebook page and visit the ‘Turn the World Upside Down’ app to submit the photo, the number of people turning upside down, The name of your club (Bronco Elite!) and your city and state.